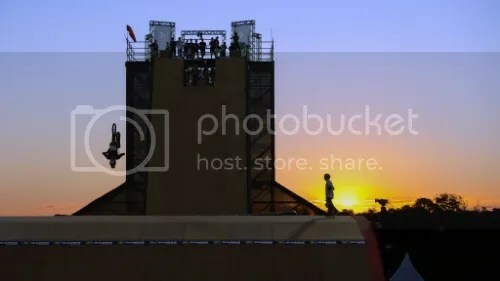 This reel sums up the theme of this year’s Summer X Games for me: a return to the past. Some familiar faces topped the podium while newcomers demonstrate a bright-eyed enthusiasm I had as a teen who had just discovered action sports. I made my return to the FMX forums and was inspired to start skateboarding again. Even the soundtrack was nostalgic with new songs by Linkin Park, a band I was completely obsessed with in high school (I still like them; I’m just less fangirly). 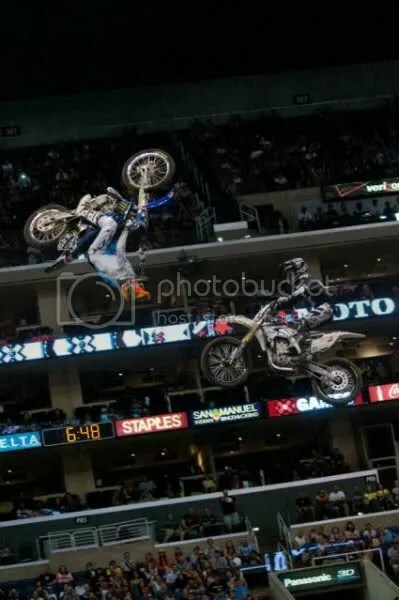 Enough reflecting though, let’s get to my top moments of X Games L.A. 2012. It’s hard to believe that Alexis was nervous about the course. She hit some of the biggest obstacles and gaps, and her high first run score made all the competitors step up their game. Her gold, medal number four, reinforces the fact that she is one of the most consistent skaters in Women’s Street. Tom was the only member of the unlicensed group (as in they can’t legally drive) to make both the Big Air and Vert finals. He can do 900s and 1080s, and while he lacks the amplitude or technical tricks down yet to truly be a threat veterans like Bob Burnquist and Bucky Lasek, they have already got their eyes on him. As much as I enjoy Step-Up, it’s not the most imaginative disciplines of FMX. This year, however, gave us an epic battle of will power and technique for the world record. It was nerve-wracking and a bit painful to watch, but the beating Matt Buyten and Ronnie Renner took made the finale so worth while. The backflip bike flip is one of those tricks that makes absolutely no sense until you see it happen (and even then it’s mind-boggling). It’s so unique, and the precision and body awareness needed to not end up crashing in a tangle of limbs and handlebars makes this one of the most impressive things I’ve seen in a while. This is my current desktop, and my mind continues to be blown by the image. It clearly captures what is so crazy about doing a rock solid flip. While others BMX Park riders were eyeing the gold, Gary was eyeing his phone. Two days before the contest, he actually rushed to San Diego after his wife was thought to have gone into labor. That wound up being a false alarm, but Gary admitted that he didn’t care about winning and was going to drop everything to be able to be with his family. Talk about devotion. “I do good here; I do bad here—either way I win a baby,” he told X Cast. Gary and his wife Sarah welcomed their baby girl Leena earlier today. Congratulations! This presentation definitely made me appreciate the stunt a lot more, especially since the drivers made it look so easy. I’m glad they gave props to the engineers because without science, none of this would have been possible. Kevin has missed the last two Big Air finals, and in that time, he has endured five major dislocations and three surgeries. I was a bit worried that his shoulder would still cause him problems, especially after the hard slams he took this year. However, he forged ahead and wound up claiming bronze. Dealing with critics is never easy. 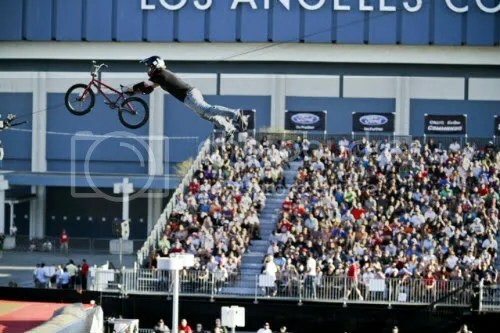 Kyle has had many naysayers tell him that he doesn’t have what it takes to do the bike flip, and in the Big Air finals, he had to make the difficult decision of not taking a second run despite the backlash that would undoubtedly happen. He handled all the booing and name-calling with grace, and that is why he’s one of the most inspirational athletes at this year’s X Games. Carey (right-side up) racing against Edgar Torrenteras. Photo by Olivia Bush (X Games Tumblr). While I’m not the first to give Carey a Lifetime Achievement Award, he truly deserves the recognition for all he has given FMX and the X Games. 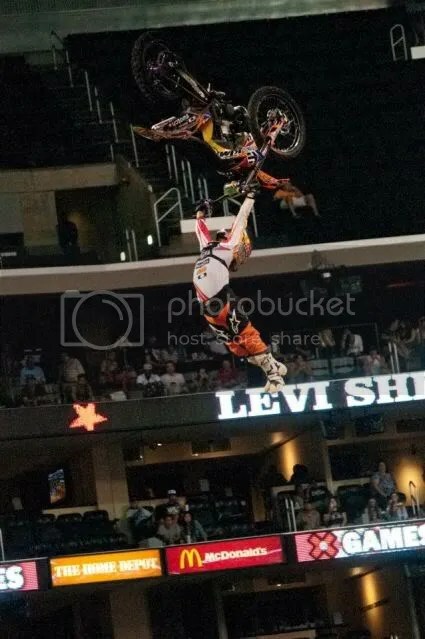 In 2001, we saw one of the most horrific crashes at X; the next year, he reclaimed the backflip, now a staple in FMX. After a hiatus, he started racing SuperMoto and later Speed and Style. 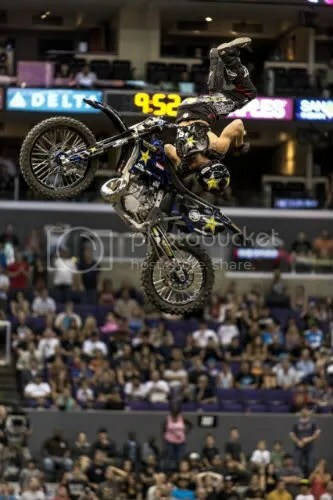 Although he didn’t make the finals this year, he had a good last X Games race. We’re going to miss seeing you compete at X, Carey! Before we completely wrap things up, I’d like to share an article that linked to this blog: “7 X-games rules to apply to your marriage”. It gives you relationship advice with a FMX theme. Maybe the newly engaged Taka Higashino should take some notes. 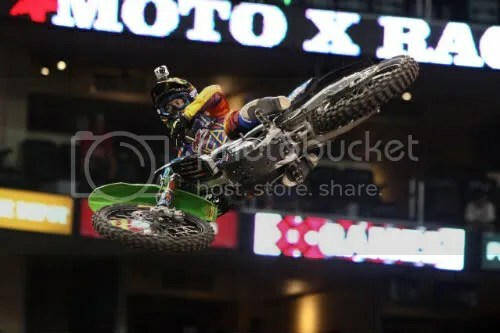 Saturday at the X Games was just crazy. There were so many events going on (half of which were competing with what was apparently the second longest Wimbledon match for airtime). Among them was the Hot Wheels Double Loop Dare. It was a short one-shot event, which almost seemed like a waste considering how much space the loop took up. However, the feat was impressive, and it’s now in the record books. Park was like a trip down memory lane. 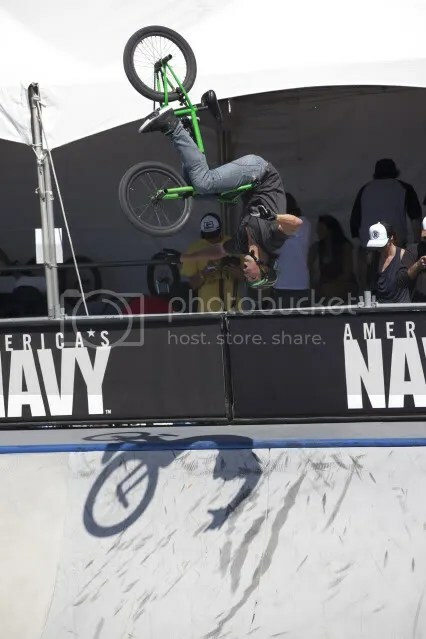 Familiar names like Ryan Nyquist and Scotty Cranmer were in the finals, and I was watching alongside my brother (who has fallen out of the scene). Good times. Patrick Casey did flair whip in such a small space. It was shocking. Brett “Banana Sandwich” Banasiewicz (actually his nickname is “Mad Dog”) had some HUGE tricks, like a triple whip and a 900, but he didn’t even medal. That’s how stiff the competition is and how important picking the right lines is. I panicked for a minute when I saw the Vert results on Twitter because I thought it would be broadcast live on TV. Who knew that the X Games could have spoilers? 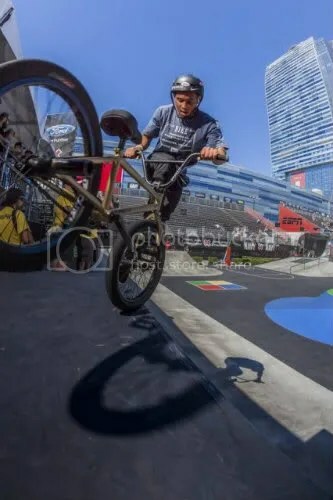 Dennis McCoy is the only BMXer among the four athletes who have competed in all 18 X Games. 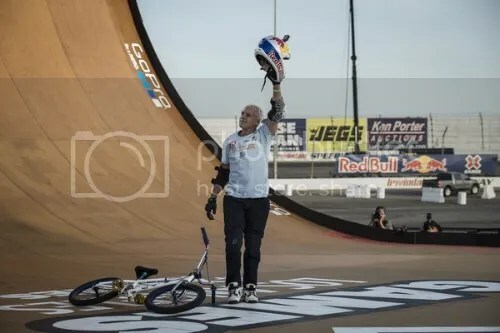 Jamie Bestwick was the first rider to break 40 points in the finals, and there was no stopping him after that. Steve McCann had great amplitude but took a hard crash in one of the early runs. All the guys rode well, but Jamie just has much more variation. 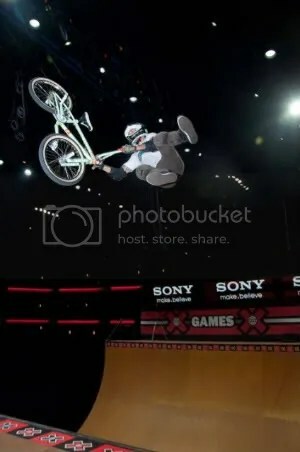 It also helped that he didn’t have set-up airs (though I noticed that many more riders are now packing in the tricks). Vince Byron made tailwhips look easy. He also attempted a decade air. Both Steve McCann and Simon Tabron opted out their last runs probably due to the pain they were feeling from the crashes. Best save your body when you know that unless you’re at 100%, you’re probably not going to beat Jamie. Ashley Fiolek was absent from Women’s Moto-X Racing due to concerns about concussion effects. She hit her seven times this past year, the latest being three weeks ago (where she didn’t even remember finishing). Vicki Golden got the holeshot, and that was it. By the end of the race, she led by 7 seconds. They should have Vicki in Best Whip next year. The camera angle for Speed and Style sucked for showing tricks over the big jump. Robbie Maddison had a bad crash over the whoops in practice. ESPN first reported that he broke his tibia and fibia, but apparently that was a prior injury that confused the hospital staff. He did suffer from a collapsed lung and lacerations on his leg. Matt Buyten was apparently “pleasantly surprised” at not being sore from the previous night’s Step-Up marathon. This was Carey Hart’s X Games swan song. He put up a really good fight against Edgar Torrenteras in the quarterfinals. It looked really scary whenever riders were going bar-to-bar up the ramp, especially when they were both planning to flip. One slight bobble and it would be ugly. ET didn’t have enough speeding going into a backflip and crashed hard. He was lucky to have gotten the bike all the way around, but it was a rough landing. He was carried out on the stretcher while throwing the horns. The finals was between Nate Adams and Mike Mason. Both looked incredibly comfortable with course, and their jerseys were similar in color so “yellow” and “black” was a very good way to distinguish them from afar. 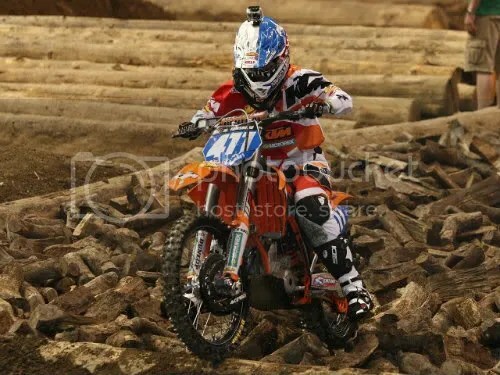 Mase’s arenacross background definitely helped him win. 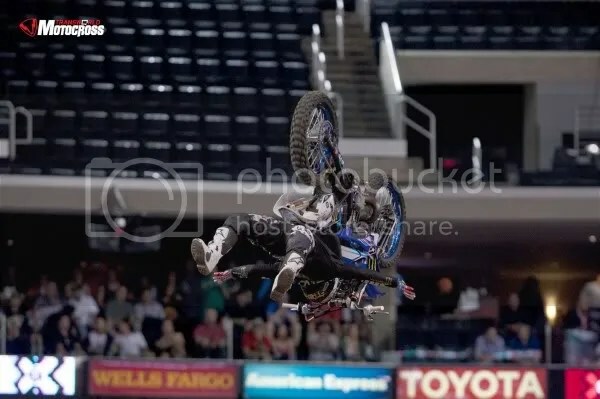 He was the smoothest on the whoops the entire night. So many motocross injuries seem to have happened these past couple of days. Get well soon to all the riders! Park started off slow, but everyone really brought out the big tricks in the finals. It was cool seeing vets Andy MacDonald and Rune Glifberg in the finals. I tend to forget that they are park skaters too. Kevin Kowalski saved himself from a fall (they can only have two before the run is over) with a nice revert. Pedro Barros lost his hat doing a trick and then came back around to grab it in the middle of his run. Talk about cool under pressure. It was a big battle for first between Pedro, Rune, and Ben Hatchell. Ben put up a really good fight. His tech tricks got him the highest scoring run. Three of the four X Games super vets (that’s what I’m calling the guys who have been in all 18 comps) were competing in Vert: Andy MacDonald, Bob Burnquist, and Rune Glifberg. Rob Lorifice and Adam Taylor looked sunburned. Wonder if they forgot their sunscreen during Big Air. Body varial = body doing a 540 + board doing a 360. There appeared to be some strategic skating during the heats, as competitors refrained from throwing their biggest tricks (according to Tony Hawk, it might get scored lower later). Skateboard Vert had the most pottymouths. The TV would go silent for a couple seconds around the times guys who bail from a trick. I finally put two-and-two together when Sandro Dias had an “oops” expression on his face after saying something. Pierre-Luc Gagnon trains for skateboarding by boxing. 12-year-old Tom Schaar brought back memories of a young Shaun White. Even though they were low, his 900s were so smooth. Can’t wait to see more from him. Last year it was Shaun versus PLG. This year, it was Bucky Lasek versus PLG. Apparently Andy barely makes 720s when he’s practicing with Tony, but he always stomps them in contests. That sounds like good luck or efficient skating. Both Bucky and PLG scored a 91, but Bucky had to work to break the tie since PLG had the higher average of five runs (normally they average three). Double grab are good in FMX due to difficulty. In skateboarding, it often means you’re desperate to not fall. PLG fell on his last run so that gave Bucky a chance to take the gold away. It looked like he was about to with the way he barely stayed on the board (working some Bob Burnquist magic). It was close but not enough. Congratulations to Scotty Cranmer (BMX Park), Ryan Decenzo (Game of SK8) Pedro Barros (Skateboard Park), Jamie Bestwick (BMX Vert), Vicki Golden (Women’s Moto-X Racing), Mike Mason (Moto-X Speed and Style), and Pierre-Luc Gagnon (Skateboard Vert) on their victories! Inspiration of the Day: Jono Schwan – At 15, he already has his own charity, and he’s helping raise money for the people who lost their homes in the Colorado Springs fires. Question of the Day: What is your favorite Carey Hart X Games moment? I missed about half of Day 2 due to a late family dinner and then getting stuck in traffic. My dad’s iPad let me keep up-to-date with the results, but no ESPN app means no watching. Luckily some of the events got delayed/lasted longer than usual so I made it home in time for the end of Step-Up and Best Trick. A Tumblr user challenged my prediction of Garrett Reynolds getting the five-peat in BMX Street. I was curious to see if Chad Kerley could beat Garrett. The finals was really just Chad versus Garrett. Their highest scored were eight points greater than the rest. However, the “battle for bronze” was pretty exciting too: lots of solid riding from everyone, notably Dakota Roche. It’s hard to believe that Chad is a Summer X rookie. He rode so smoothly. Harder to believe is the fact that Garrett can get an equivalent score even with a fall (though his fall was at the last second so I wonder if the judges really counted that). His barspin 540 wallride was one of the sickest tricks of the day! Apparently Snoop Dogg Tweeted for people to vote for Twitch in Best Whip and called him “my nephew”. Matt Buyten and Ronnie Renner made a joke out of the current record of 37 feet. It was a duel between Step-Up styles: Ronnie’s whipped form versus Matt’s straight-on method. The hard landings were making me cringe. Jeremy McGrath sounded pained when he talked about it, and Travis Pastrana apparently walked out of the announcers’ booth. Landing is a hazard. Ronnie was obviously in pain, but he really wanted the gold. Sometimes it’s not about having fun. The new record is 47 feet! After the dramatic showdown in Step-Up, my heart continued to race for Best Trick. Sometimes I think that FMX will be the end of me. Thomas Pages did a weird sideways body varial. Travis’ mind was blown. Taka Higashino was defying both physics and death with the rock solid backflip. He had to fight the centripetal force of a flip and the danger of missing a grab or hitting the front brake. Double backflip is old and not technical, but its risk factor led to Cam Sinclair’s high score. Kyle Loza’s BMX-inspired bike flip is apparently 8-9 years in the making. People were saying that he’s too small. Jackson Strong did a shirtless backflip body varial double grab… a.k.a. the Jack. Thomas repeated his varial on the larger gap but got a lower score. I’m confused about that result. To do a 720, you have to pull hard on the bars like you’re doing a double backflip, according to Travis. However, you can’t pull too hard. Poor Clinton Moore crashed on the 720 and then got hit by a bike. Maybe X Games officials shouldn’t try to move riders’ bikes. Taking your left hand off on the landing was apparently worth 0.33 points. Kyle wanted to show that the bike flip is possible and prove the critics wrong, which makes his decision to not take a second run so much more difficult to watch. I’m really disappointed in the so-called fans who boo’ed him and called him names on-line. At the end of the day, we should be wanting our guys to be safe and sound. I want to send my best wishes to Myles Richmond and Kyle, both of whom left the Staples Center in a stretcher. Mad props to Alexis Sablone for juggling education with skating. I had such a hard time just keeping up as a spectator while in college, and she excels at both (being an archi is hard and she’s going to do grad work at MIT). Rachel Reinhard had one of the sickest tricks: a double kickflip over the chain. Alexis took a lot of risks to endure her lead, going over large gaps and trying a grind over the handrail. Lacey Baker also tried to go big by attempt to jump two of the chains diagonally. If anybody doubts the skills of women’s skateboarders, this final definitely would prove them wrong. Congratulations to Alexis Sablone (Women’s Skateboard Street), Garrett Reynolds (BMX Street), Bob Burnquist (Skateboard Big Air), Jeremy “Twitch” Stenberg (Moto-X Best Whip), Ronnie Renner (Moto-X Step-Up), and Jackson Strong (Moto-X Best Trick) on their victories! Inspiration of the Day: All the FMX riders – so much courage and strength. Question of the Day: What did you think of the judging in Moto-X Best Trick? Originally I had planned to combine my Day 1 and 2 notes since there were only two events on Thursday and I had to miss half of yesterday’s action. However, I had so much stuff written down that I decided to split them up again. It’s a little surprising since I’ve also been Tweeting during the broadcast. You can blame social media for keeping me away from making these posts, but on the bright side, I’ve made my return to the freestylemtx.com forum (it felt like an overdue homecoming). Since Freestyle was juxtaposed with Skateboard Big Air, I noted the difference in announcing styles. Tony and Sal are like the nice parents who give their kids a gold star for effort while Cameron and Tess are the more critical Asian parents. Taka Higashino’s rock solid backflip, the first ever, was insane! He let go three times while upside down. Todd Potter wins the marketing award for handing out fake mustaches. Levi Sherwood not only had great extension but he held his tricks out for as long as possible. Taka’s run was apparently written in Japanese so no one else could figure out what he did. I bet FMX trick names are written out in katakana. Todd’s whip was huge… a glimpse at what he’d do for Best Whip? Levi’s legs actually go over his head on the tsunami flip. It was like yoga on a dirt bike. Adam Jones really got the short end of the stick. I kept hearing about how he was underscored, but his second run wasn’t even aired (it was the only run not aired). The tie breaker between Nate Adams and Javier Villegas was confusing. The broadcast said Javier got the bronze, but they didn’t explain that the judges averaged the highest and lowest scores of their best run back in, instead of looking at the second run score. To make things worse, the site listed Nate as third, which made me think ESPN pulled a CNN. Everything finally got cleared up when the on-line report came out the next day. This is the first year that an American rider is not on the podium. 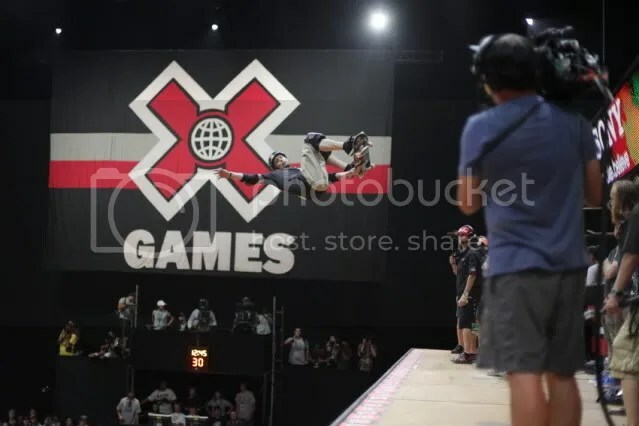 Taka is the first Asian athlete to have won a Summer X event since Takeshi Yasutoko took the gold in Aggressive In-line Vert in 2004, the last year they would hold that event. It’s interesting to see how the face of skateboarding has changed. Kids can now train at Woodward and specialize in Big Air. Thankfully, the parents don’t seem to be the ones pushing the kids so no Skate Moms reality show yet. Jagger Eaton is now the youngest X Games competitor ever. He beat Nyjah Huston by a few months. Mitchie landed the first 900 in a Big Air contest on his victory lap during qualifiers. Looks like the nerves are gone. Then Tom Schaars threw down two 9s like it’s no big deal… yet he only got second because he hit the smaller gap. I had mixed feelings about Bob automatically getting to the finals. Not that he didn’t deserve it given the pounding he received in practice, but I didn’t realize that was even allowed. It looked like the judges want more technical tricks and amplitude (makes sense considering the name is Big Air). Congratulations to Taka Higashino (Moto-X Freestyle) for being our first gold medalist! Question of the Day: Are you rooting for the old school skaters or the new kids?